If you’re reading this, my guess is you want to learn to sell on Amazon and become an Amazon seller. But why? What was it that made you decide you were going to learn how to sell items on Amazon? Was it because you heard Amazon is now a Trillion dollar company? Maybe you read somewhere that nearly 50% of all e-commerce sales in the U.S. now result from Amazon. Could it be you’re simply looking for a side hustle? Or are you chasing financial freedom in the hopes of exiting the 9-5 rat race? The Amazon FBA business, in my opinion, is our generation’s equivalent of the gold rush. However, success on Amazon is no walk in the park, you will have ups and downs. Ultimately, how you got here is not as important as where you are heading, but knowing why is. Your WHY is what will get you through those tough times. “Tough times never last, but tough sellers do.” Never give up! My personal journey to become an Amazon seller and learning how to sell products on Amazon is not without its own ups and downs. I “failed” on my first 7 amazon products. 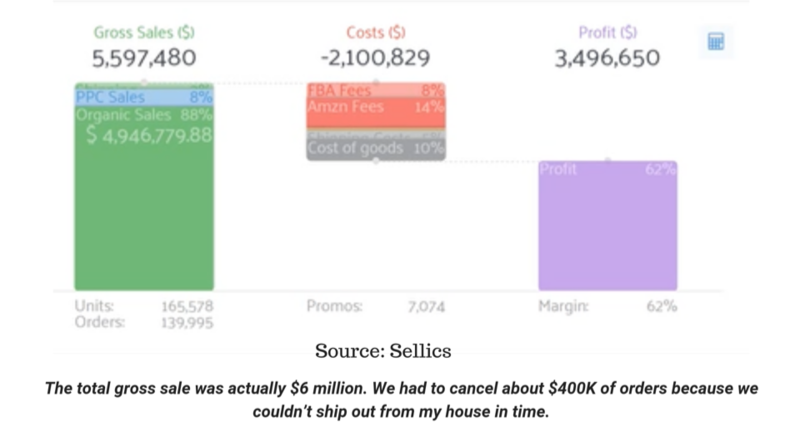 My 8th product went on to do $6 million in only 6-month on Amazon FBA business, forever changing my life in the process. Are you ready to dive in and learn how to sell products on Amazon!? Before I show you how to sell products on Amazon, let’s first try and understand what exactly Amazon is. You probably already knew that Amazon is the world’s largest online retailer, but do you know just how big it really is? Amazon’s brand recognition and infrastructure have spread to over 180 countries. 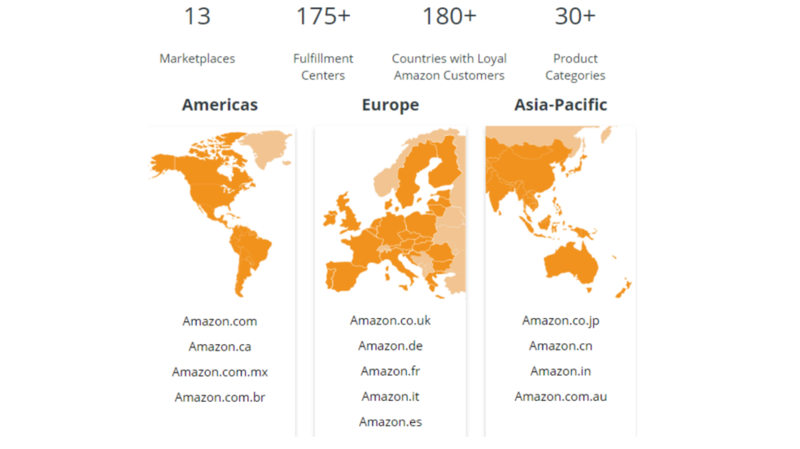 Not only can you sell in the U.S. but you can use the Amazon platform to take advantage of 13 different international marketplaces. To truly understand the value of Amazon, we need to view it more as a platform, not just a company. At its core, Amazon is simply a platform that brings sellers and buyers together. A platform that allows anyone to sell almost anything (within their guidelines) for a fee. For sellers like you and I, this should be music to our ears. Amazon basically provides everything you need to start a business; from customers to logistics and back-end support. You simply find products to sell, list them on Amazon, and ship it into their warehouse. This allows you to leverage their marketplace and various services to grow and scale your business. Amazon provides you with the world’s largest “ready to buy” customer base. Nearly 100 million people make a purchase every month. Just in the U.S. alone, Amazon generates over 195 million unique monthly visitors. This makes how to sell things on Amazon easy! Amazon’s global ecosystem of marketplaces, fulfillment centers, and logistical advantages are unmatched. No other platform gives you the capacity to sell from your living room or build an infinitely scaleable brand and business with such ease. With Amazon, you can avoid the overhead and risk involved in building your own e-commerce store. Amazon charges a fee of 15%-20% incurred upon selling. Compare that with the time and cost involved in building and maintaining your own sales channel. The most important advantage of Amazon maybe its brand equity. Amazon is synonymous with huge selections, exceptional customer service, and free 2-day shipping through Amazon Prime. Customers trust Amazon and by extension, 3rd-party sellers like you and I. 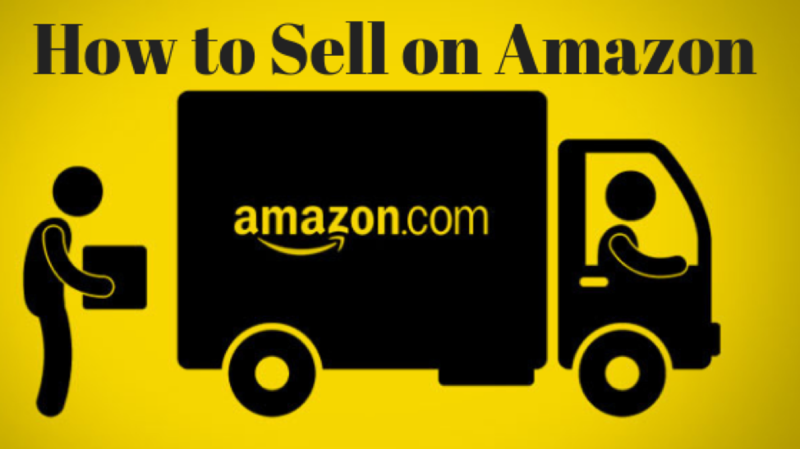 How to sell items on Amazon is made simple by FBA! Why? Amazon FBA business or Fulfillment by Amazon is a program which allows you send your inventory to Amazon fulfillment centers. How to sell on Amazon is made simple by FBA. Once your product sells, Amazon picks, packs, and ships your product to customers. They also provide customer support on every product you sell. FBA not only makes selling products on Amazon easy but seamless. The alternative to the Amazon FBA business is FBM or Fulfilment by Merchant. This is when the seller is in control of the entire handling and shipping process. This means you stock, pick, package, and ship the orders yourself. This also means you are directly responsible for providing customer service. Selling items like this on Amazon can make things a little more complex depending on volume since you are packing the orders. Although there might be times where fulfillment by merchant makes sense, our focus for this post is on Amazon’s FBA program. In most cases, Amazon FBA is the best and most cost-effective way to sell your products. One of the biggest benefits of selling through Amazon FBA is the ability to leverage Amazon Prime. When you sell your products using Amazon FBA, your items are available for free 2-day shipping for Prime members. It is not hard to see why Amazon’s Prime program is so appealing to their customers. Amazon has over 100 million prime members. On average prime members spend $1400 each year shopping on Amazon. That is twice as much as non-prime members. There is simply no other platform that can offer sellers this kind of built-in customer base and logistical infrastructure. Now that you have a better idea of how Amazon works, let’s look at the step by step process of how to sell items on Amazon. The process of selling on Amazon requires four simple steps: register, list, ship, and lastly get paid. 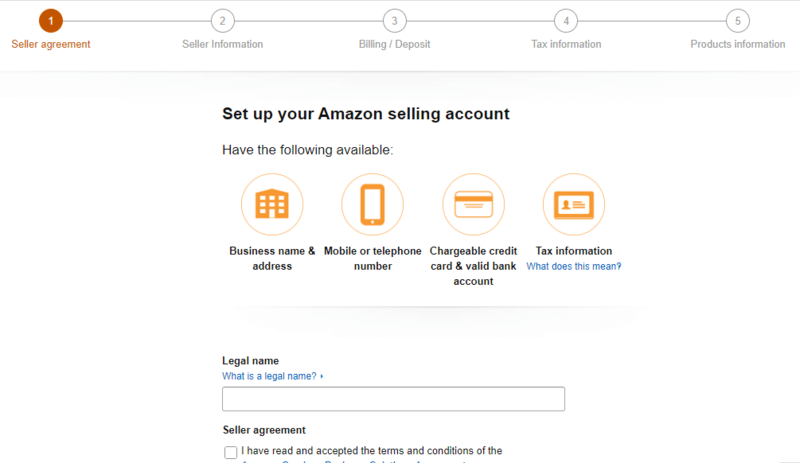 Step 1: Sign Up on Amazon In order to sell items on Amazon, you first need to sign up for a seller central account. Click here to register. There are two options for an Amazon seller account; sell as a professional or sell as an individual. Selling as an individual is for people looking to sell fewer than 40 items per month. With this plan, Amazon does not charge a monthly membership fee. You pay $0.99 per sale plus other minor selling fees. Selling as a professional is for people looking to sell more than 40 items per month. With this plan, Amazon charges a subscription fee of $39.99 per month, plus individual transaction fees. Once you choose the category to sell under, you would then need to set up your Amazon seller account. Business name – This is the name visible to customers on Amazon. Legal name and address – This will be stored in your account for Amazon’s reference. Contact information – Amazon will contact you using this information for many reasons. Product ship location – This will show customers where your products ship from. Bank account information – Amazon pays you every 14 days if you make sales. Shipping options – Select which worldwide regions you are willing to ship to. Once your account is active, fill out the customer-facing seller profile section. This includes the “about seller” section, your seller logo, and return and refund policies. Step 2: List Your Products The next step to selling on Amazon is to list your products on the Amazon Marketplace. The products you sell will fall into two categories: products already listed on Amazon and new products of which you will be the first to list. Products with listings already on Amazon are easier and faster to make active for sale. 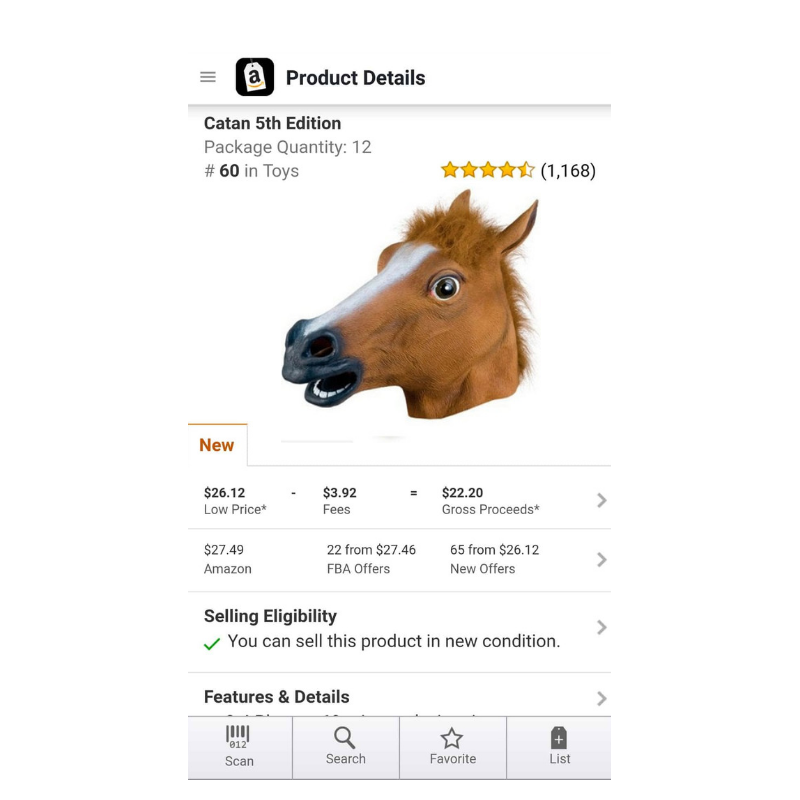 Search Amazon’s database for the EXACT version of the product. Once you find it click “sell yours.” chose the condition and quantity you have to sell. UPC number – This is a unique 12 digit barcode used to track your products. SKU number– This is a number that you create to track each of your listings. Product title – This should describe your product to customers accurately. Product Description – This is where you would thoroughly describe your items. Product image – Amazon requires high-quality product pictures with 500 x 500 pixels on a pure white background in the main product image. Search terms – For each product, Amazon allows five fields of 50 characters in which you can list search terms. Select ‘Manage FBA Inventory’ on your Amazon seller dashboard. On the drop-down menu select ‘Send/replenish inventory. On the ensuing screen you would click ‘Send Inventory’. This will take you to ‘create new or add an existing shipping plan’. Chose “create a new shipping plan’ and select ‘Case-packed products’ under packing type. On the next screen enter the number of units (products) and cases (boxes) you will be sending to Amazon. The next step is to prepare your products for shipping. This means correctly packaging in a way the will ensure safe delivery for your products. Lastly, click ‘print labels for this page’. Print your labels, stick it on your shipment and click ‘complete shipment’ on the last page. If you are doing fulfillment by merchant, you are responsible for packing and shipping each order to customers. You ship based on the shipping method buyers choose and Amazon will reimburse you for those shipping rates. Step 4: Get Paid. The last step in the process of how to sell on Amazon is the best part. It’s time for you to get paid! Amazon deducts all applicable fees relevant to your account then deposits payments into your bank account every two weeks. You will get an email notification every time you receive your payment. Retail stores: You can buy items to sell on Amazon at your local retail stores or online. The key is finding products at a discount, which you can then list for full price on Amazon and capture the difference in price as profit. Wholesale suppliers: You can buy items in bulk from distributors and resell them on Amazon. Manufacturers: You can private label products and list them for sale on Amazon. This would allow you to either invent a new product or modify an already existing one to add value. Gated vs. Ungated and Restricted Products: Before you source products to sell on Amazon it is critical you first figure out if that particular product is gated or ungated. Gated products require prior approval by Amazon before you can start selling it. Familiarize yourself with Amazon’s guidelines on categories that require approval. More importantly, every Amazon seller needs to carefully review Amazon’s list of restricted products before they start selling. Not abiding by their policies will result in you getting banned from their platform. You don’t want that! Amazon Seller Central App: Every Amazon seller doing retail arbitrage (buying retail & reselling on Amazon) should download the Amazon Seller Central app. And most importantly if you are eligible to sell that product on your account. Whether you are interested in learning how to sell on Amazon because you want extra income or utilize it to completely change your financial life as I did; I want to congratulate you on taking ACTION! “The Journey of a 1000 miles begins with one step.” – Lao Tzu In 2018 alone, there are one million new sellers on Amazon. That’s 3,398 new sellers every single day. (Marketplacepulse) Despite this stream of new sellers, only few will actually become active and start selling on Amazon. I cannot emphasize enough the importance of taking ACTION! Looking for what to sell on Amazon? Check this article out! Selling on Amazon forever changed my life! With the right information and resources, you too can use this platform to realize your dreams. I was exactly where you are not too long ago. I tried, failed and tried again. The KEY to my success was perseverance. In hindsight, I didn’t really “fail” I learned how to sell on Amazon! I did so 7 times and ultimately became a multi-millionaire at the age of 25. My new passion in life is teaching how to sell on Amazon and to help others also realize their dreams by selling on Amazon. I put everything I learned on how to sell on Amazon, along with lessons from other 7-figure sellers into this [$1 Amazon course]. No UPSELLS. NO PAID MASTERMIND GROUPS. NO BS. Just value in the form of 200+ videos, which took 8 months of work to create. Not only is this the most comprehensive Amazon Course on the market but where “Amazon gurus” are charging thousands of dollars for information, I made it my mission to give back to people like you by providing it for only $1.